The FBI processed a record number of firearms-related background checks last year, indicating that more guns were sold in 2015 than in any previous year in American history. The record gun sales came as Democrats moved to implement new gun control measures at the federal, state, and local levels. Hillary Clinton, the leading candidate for the Democratic presidential nomination, said that the Supreme Court’s decision in the District of Columbia v. Heller gun rights case was "wrong" and she and President Barack Obama praised Australian-style gun confiscation. Gov. Terry McAuliffe of Virginia (D.) issued an executive order imposing new gun control measures and the Democrat-controlled city council of Seattle imposed a new tax on guns and ammunition. Gun rights activists say that Democrats’ new aggressive posture on gun control contributed to 2015’s record sales. "A day has not gone by without a major media assault on gun rights or an Obama administration call for new additional restrictions on gun ownership," said Alan Gottlieb of the Second Amendment Foundation. "Americans have voted with their dollars and bought record levels of guns and ammunition." In the second half of the year, terrorist attacks in Paris and San Bernardino, California drove gun and ammunition sales even higher. Some dealers reported seeing their business triple in the wake of the attacks, cautioning that the spike was drying up supply in some areas. 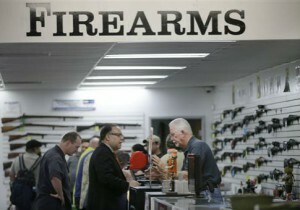 Gun rights activist believe that sales will continue to set records in the new year.